We’d love your help. Let us know what’s wrong with this preview of Maybe a Mermaid by Josephine Cameron. Eleven-year-old Anthoni Gillis is not the kind of kid who believes in fairies, unicorns, or even the word “maybe.” She’s more of a comic-books girl. So when her mom brings her to Thunder Lake for a summer at the Showboat Resort, she doesn’t believe the local rumors about the Boulay Mermaid. Anthoni has bigger fish to fry. She’s always wanted a True Blue Friend. But it’s bee Eleven-year-old Anthoni Gillis is not the kind of kid who believes in fairies, unicorns, or even the word “maybe.” She’s more of a comic-books girl. So when her mom brings her to Thunder Lake for a summer at the Showboat Resort, she doesn’t believe the local rumors about the Boulay Mermaid. Anthoni has bigger fish to fry. She’s always wanted a True Blue Friend. But it’s been hard to find one, since for the past five years she’s been bouncing from town to town, helping her mother sell Beauty & the Bee cosmetic products to keep them both afloat. This summer will be different, though. Anthoni has a plan―a foolproof checklist for making lifelong friends! There won’t be any maybes this time. But as she grows entangled in local gossip, and her mother stretches the truth, Anthoni must decide if she’ll “stick to the plan,” like always, or dive into a summer full of extraordinary possibilities. To ask other readers questions about Maybe a Mermaid, please sign up. what is the age range for children to read this? This was an offbeat and quirky book (Where were all these books when I was in elementary school?) that had me smiling through the whole thing. Its a fun story about Anthoni and her mom, both trying to find their way. Anthoni is looking for a True Blue friend and take care of her mom... her mom is doing the best she can to provide for her daughter and make ends meet. (Bad grammar there? Yup, but too stuffed to care haha). The Showboat was in the plan but not everything is as it seems. And some people surprise Anthoni in ways she wasn't expecting. Loved Charlotte, she was a hoot and so much fun. We get glimpses into her life but I would have loved to learn more about her too (Compliment!). There were a few instances with her that tugged at my heartstrings. I just wanted to give her a big hug and sit with her for awhile. DJ was a "weirdo" to the other kids *rolls eyes* He and I would have gotten along fine if I was that age. He was a Good Soul like Charlotte. That rock collection of his I would have loved to see. The snippets of history we get throughout the book were interesting too, something I will look up later when I have more time. Reading little bits of this type of stuff sometimes make me wish I could travel back in time to witness it myself. I would recommend, this is a wonderful novel not just for kids but for adults too in my opinion. Just kick back, relax, and have fun :). Not alot to say but high praise really.. sometimes you just can't find all the words :). Have you ever had a good thing right in front of your face and you didn't realize it? Anthoni Gillis is in this exact situation. She has a plan to get a True Blue Friend, one that will always be with you through thick and thin, but so far in her eleven year old life, she has not found one. Her mom sells Beauty & Bee cosmetics and she is working her way up the company; however because of her success they have always moved around and Anthoni has never been able to make a true blue friend. When Have you ever had a good thing right in front of your face and you didn't realize it? Anthoni Gillis is in this exact situation. She has a plan to get a True Blue Friend, one that will always be with you through thick and thin, but so far in her eleven year old life, she has not found one. Her mom sells Beauty & Bee cosmetics and she is working her way up the company; however because of her success they have always moved around and Anthoni has never been able to make a true blue friend. When her mom surprises her with a summer trip to Thunder Lake and the Showboat Resort, where her mom grew up, Anthoni assumes it is because her mom is about to advance in the company. She soon finds out that it is completely the opposite. Her mom has not been following their plan and is slowly loosing control of her business. Antoni is furious with her mom but she meets Maddy, Juile, Kurt and DJ and instantly knows that Maddy is going to be her True Blue Friend. Little does she know that things are not always as they seem - when it comes to her friends and when it comes to the crazy lady, Charlotte, who runs the Showboat Resort. Will Antoni work her plan and make Maddy her True Blue Friend? What about DJ? He has been by her side the whole summer, but when he is pushed aside by Antoni's plan to make Maddy her True Blue Friend, will he be able to overcome his hurt feelings? Can Antoni's mom get her business plan back on track or will they be forced to come up with another plan? Don't miss this endearing story of family, friendship, and the persistence to get what you want out of life! This is such a precious story of a girl who just wants a friend and then doesn't realize it when one is right in front of her face. It's also a story of a girl with a concrete plan and finding out that not all plans work out like you think. I love Antoni's work passion and her passion to find a friend. I also love that when her plan doesn't go the way she expects it to, she doesn't give up on her plan, she just reevaluates it. This is a must read book for 2019! Thank you to the author and publisher for sharing an early copy with our #bookexpedition group! A sweet story of friendship that middle grade readers will enjoy, Maybe a Mermaid follows 11 year old Anthoni who is looking for a True Blue Friend. Anthoni and her mom have just returned to the lakeside resort where her mom spent her summers, though its run down appearance looks nothing like her mom remembers. Readers will cheer for Anthoni as she faces challenges in finding that True Blue Friend and Thank you to the author and publisher for sharing an early copy with our #bookexpedition group! I absolutely loved this debut from author Josephine Cameron. A story that readers will love and with a main character, Anthoni, who is searching for her True Blue Friend in difficult circumstances. Although the reader can see what she is searching for is right in front of her, we take the journey with Anthoni and cheer her on the whole way. Featuring a dash of magical realism, it’s the belief of what could be that keeps us all going. Anthoni Gillis and her mother have moved frequently as her mother moves up in the ranks of Beauty and the Bee cosmetics. When her mother moves up a level, she takes Anthoni on a long-promised vacation to Showboat Resort at Thunder Lake, a place she spent six "perfect" summers at when she was a girl. When the two arrive, the whole place is in disrepair and is being run by Charlotte Boulay, the now elderly daughter of the owners. Anthoni's mother reconnects with her childhood friend, who isn't really interested in spending time together. Anthoni hopes that she and the daughter might become True Blue Friends, but that doesn't work out either. Instead, Anthoni starts hanging around with DJ, and the two discover some secrets about the resort and Charlotte. Back in the day, Charlotte was the Boulay Mermaid, but how she managed the act is something Anthoni doesn't understand. Since Anthoni's mother's business is not doing well, the two plan to move to Chicago when their time is up at the resort, and Anthoni hopes she can make a friend before they go. When she tells a potential friend that she can show her a REAL mermaid, Charlotte graciously agrees to help, but when the show almost ends in disaster, Anthoni is forced to face some difficult truths. Strengths: I am a complete sucker for run down resorts and especially Storybook Forest theme parks. The setting was awesome, and I didn't even mind the horrible flashbacks I had to swimming lessons in the lake! Anthoni and her mother's various positive mantras were great fun, and I also had some Amway flashbacks-- my parents sold it briefly, and I helped with the various demonstrations of the products. Anthoni and DJ had just the right level of supervision that they were safe but were able to get into some trouble! The inclusion of information of vaudeville was fun. There should be more middle grade novels about vaudeville! Weaknesses: I couldn't pin down the timeline. Charlotte seemed like she would be about 90, but the mother would have been at the resort about 20 years ago. I didn't think about it too hard, but something seemed not quite right. This debut middle grade novel lives up to its cover and will be a delightful summer discovery for readers. You can't help but root for Anthonie and the quirky cast of characters she meets at the Showboat Resort. Maureen Boulay alone is worth the price of admission. Readers will learn along with Anthonie lessons about friendship, loyalty and looking below the surface for the truth. Highly recommended! Thank you to Macmillan and NetGalley for a digital ARC of this book in exchange for an honest rev This debut middle grade novel lives up to its cover and will be a delightful summer discovery for readers. You can't help but root for Anthonie and the quirky cast of characters she meets at the Showboat Resort. Maureen Boulay alone is worth the price of admission. Readers will learn along with Anthonie lessons about friendship, loyalty and looking below the surface for the truth. Highly recommended! Competently written but lacks diversity in a way that feels deeply out of touch with the rest of publishing. I mean the only two people of color are announced first by their race, then their special talent (tap dancing), then by name - and at that they are thanking white folx for giving them a job. Additionally there are some comments on the body of an older woman that didn't sit right with me. Which is a shame because the pacing and emotional arcs of the characters are good, but it feels like i Competently written but lacks diversity in a way that feels deeply out of touch with the rest of publishing. I mean the only two people of color are announced first by their race, then their special talent (tap dancing), then by name - and at that they are thanking white folx for giving them a job. MAYBE A MERMAID, by Josephine Cameron, was a sweet little adventure story about finding a True Blue Friend, and creating a summer to remember. I loved the constant references in Anthoni and her mom's life relating to the direct sales business. This book grabbed my attention, and I really felt everything Anthoni went through. I would highly recommend this book to anyone looking for an escape from reality for a little while. How is this a first time author’s work? Oh my goodness. What a lovely book. Relatable and quirky characters, a summer setting, and enough humor for two books. Please tell all your ES kids to read this one. Order it for your libraries. It’s that good! So great! I want to read it again. 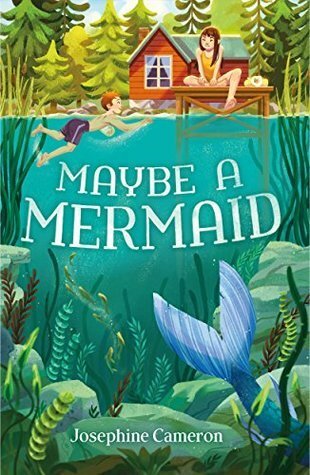 In this poignant story of a girl searching for her True Blue Friend, Josephine Cameron's Maybe a Mermaid touches the heart and reminds readers what real friendship is all about. The pre-teen years are hard, and making friends can be torturous. Through her writing and characters, Cameron shows us that your friends are not always who you expect. Anthoni and her mom always have a plan and the number one rule is to "Stick to the Plan". It's worked so far, so when her mom drags Anthoni to The Showboat In this poignant story of a girl searching for her True Blue Friend, Josephine Cameron's Maybe a Mermaid touches the heart and reminds readers what real friendship is all about. The pre-teen years are hard, and making friends can be torturous. Through her writing and characters, Cameron shows us that your friends are not always who you expect. Anthoni and her mom always have a plan and the number one rule is to "Stick to the Plan". It's worked so far, so when her mom drags Anthoni to The Showboat Resort, a run-down, ancient, and practically abandoned hotel on the shores of Thunder Lake, Anthoni believes that everything will be OK if they stick to the plan. Her mom's business will get back on track, and Anthoni will make a True Blue Friend, something she's never had. Only, the summer doesn't go exactly according to plan. Anthoni finds herself in a swim class with kindergarteners and is afraid to put her head in the water while the other kids her age are waterskiing around the lake. She chooses a Potential - someone she thinks should be her True Blue Friend and spends the summer trying to make it all work out. With the help of the eccentric lady who runs The Showboat and the misfit boy who lives up the road, Anthoni decides to give this friendship all she's got, only to discover that real friends aren't necessarily who you choose them to be. This book seems a little quirky at first, but the characters develop as the story goes on and by the end readers will find themselves fully immersed in The Showboat Resort and rooting for Anthoni to find her True Blue Friend. The message in this book is perfect for any kids who struggle with making friends and any young middle grade reader would enjoy this story. I received an advance copy of this book from the publisher on Netgalley. I completely fell in love with this cover - it is AMAZING and I love it. The text within is also really good. I loved all the characters and the story. It struck a good note between plot and character development across the board. It was funny and sweet and written at, what I think, is a great level for middle grade readers who want something a little fun, a little serious, and easy to read. You can read the official plot but I received an advance copy of this book from the publisher on Netgalley. I loved Charlotte Boulay and DJ the absolute most as characters. They both had the best parts because they were eminently ALWAYS already themselves. They didn't try to pretend to be anyone different ever for anything and I appreciate that in role models. The story, as I said, was good and had a nice plot that kept along at a steady clip while also having time for the main character to have thoughts and develop as a person. Nice life lessons on friendships and what being a friend actually means. That this is Cameron’s debut novel is a delight, because it is a seriously strong first offering. She’ll be one to watch. Eleven-year-old Anthoni Gillis grew up hearing her mother Carrie’s memories of Thunder Lake and the Showboat Resort. It was a magical place that Anthoni was eager to experience herself. The Showboat Resort is not magical in that it promises fairies or mermaids, or even X-Men-level mutants; it was a place where True Blue Friends were found and made. As a sales rep and team leade That this is Cameron’s debut novel is a delight, because it is a seriously strong first offering. She’ll be one to watch. As a sales rep and team leader for Beauty and the Bee products, Anthoni’s Mom moves them around frequently and it has been difficult for Anthoni to make friends, let alone a friend who will remember her after she’s gone. A summer vacation at the Showboat Resort sounds like just the thing both Anthoni and her mom could use. Besides the promise of a True Blue Friend, a vacation at the Showboat resort means their business goals have been met. They can relax from the hustle. Maybe a vacation will offer Carrie a reprieve from having to turn every new person she meets & old friend she has into a client or, even more necessary, a colleague. And maybe a vacation at Thunder Lake will offer Anthoni an opportunity to see her mom in a different way: someone who is less about ‘sticking to the plan’ than previously believed. Only ‘sticking to the plan’ is a good and necessary thing in Anthoni’s mind. Stability and comfort is found in writing and implementing business plans. (I totally have a friend or three like this). Anthoni has her own plan for how to achieve her goal of a True Blue Friend. Needless to say, Anthoni’s business plan is not fail-proof. That list of what she’s looking for in a friend and how she is going to go about making a friend are going to meet interference. That beautiful book cover image should have a girl in a sparkling bathing suit, and there should be absolutely no mermaids—because Anthoni is not about Mermaids, or even Maybes. The Gillis Girls have a lot of declarations between them that read like motivational posters. The statements integrated into Anthoni’s narrative and narration add an unexpected form of whimsy, especially when they are maybe revealed as much a form of fantasy as any other tale told in Maybe a Mermaid. The owner of The Showboat Resort, Charlotte Boulay, would say that people will believe what they need to believe—and it’s all in the sale’s pitch. She would also, quite bitterly, suggest that there is no such thing as a True Blue Friend. The problem is, that while Anthoni could’ve used a friend before vacation, she could really use one now that things with her mom and their life come under serious strain. Anthoni can’t afford much more uncertainty, and she takes a page from her observations of her mother: she will make her own magic. In order to be True Blue Friends with Maddy Quinn, she’ll need more than a common obsession with X-Men comic books. She’ll need to discover the secret of the Boulay Mermaid and hope she’s as real as Maddy believes her to be. The Boulay Mermaid was part of the vaudeville world of the early 20th century. The Showboat has countless photographs of acts on its walls from back when the resort hosted performances. The Boulay’s were actors and creators in vaudeville. Cameron does quick, light work bringing this bit of history to the fore. And, of course, it will provide common ground between the eccentric Charlotte Boulay and an earnest Anthoni Gillis. They both traveled with their working parents; both of their parents selling one-of-a-kind opportunities—one for beauty products, the other entertainment. Charlotte understood Anthoni’s loneliness. Cameron writes plenty of quirky traits for her characters, but Charlotte is by far the oddest. She’s startling, but Charlotte proves carefree enough, risky enough to relieve the tension built into all the other characters. She is the vaudeville act that offsets the “real world” anxieties. Every character of any significance in Maybe a Mermaid is in some kind of conflict. They could all do with the idea of possibility; that there is a possibility of something more, of something else; that magic does exist. A mermaid would affirm something for Maddy, just as a friend would affirm something for Anthoni. That Charlotte Boulay is also very human is an important realization for Anthoni to make. There’s the person we are, and the one we want to be seen as. There is the Anthoni who cannot swim and should be with the small children learning to blow-bubbles in the water, and there is the one wearing a sparkling swimsuit splashing around with the big kids, able and unafraid to swim in the lake. There is the Anthoni who can genuinely appreciate a vampiric mermaid comic, but cannot believe a mermaid actually exists in the lake—but who will say she does to get the friend she wants (the friends she believes she needs). It’s harmless until it isn’t. Anthoni will risk a true friendship, risk another’s dignity, and risk her own life, to prove herself worthy and gain a friend. Wow, that sentence makes this middle grade novel seem darker than it is. Cameron delivers light and warmth in DJ’s efforts at camouflage despite his clumsiness and his arm in a cast; Julie’s colorful and energetic presence; Maddy’s wall art and water ski skills among other textured characterizations that add an earnestness that’s heart-warming and sweetly heart-aching. Maybe a Mermaid will get to the bottom of how much grit and magic is required to ease the harder edges of real life and what is true blue in any relationship. And Anthoni will find herself with maybe more than a single friend to remember her. That Cameron will write an unlikely friendship into a middle grade novel is hardly rare, what is noteworthy is how she goes about it. The clumsy, sweet, and intensely loyal DJ and Chapter 35 are anticipated, regardless at how heartwarming the effect. But that Epilogue is the clincher, that smile of delight that is the wink to the wave farewell. Recommended for readers of contemporary fiction; of friendship stories; of Kate DiCamillo, Erin Kelly Estrada, Barbara O’Connor. Its a good addition to stories involving single parents as well as frequent changes in address. And yes, Gilmore Girls might have come to mind with this one. Anthoni and her mom move around a lot. Her mother sells makeup at house parties (think Avon) and while things had been going well for a long time, recently sales have seriously dropped off, and they're unexpectedly in more difficult financial straits. Her mom had put down a substantial nonrefundable deposit at a fancy lake resort in the town where she'd grown up, for Anthoni to have that fun experience for the summer, but in the end, she gives up their apartment and they both go to the resort fo Anthoni and her mom move around a lot. Her mother sells makeup at house parties (think Avon) and while things had been going well for a long time, recently sales have seriously dropped off, and they're unexpectedly in more difficult financial straits. Her mom had put down a substantial nonrefundable deposit at a fancy lake resort in the town where she'd grown up, for Anthoni to have that fun experience for the summer, but in the end, she gives up their apartment and they both go to the resort for the summer, with all their belongings in their car. Anthoni is determined to make the best of things, as The Showboat Resort is going to be amazing, like her mom said, right? I had the opportunity to read a NetGalley digital ARC of this middle grade novel in exchange for a review. This book tells the story of Anthoni Gillis, an eleven-year-old girl who has no True Blue Friends. Her mother moves from town to town trying to rise up the ladder of success selling Beauty and the Bee cosmetics. Hoping to sell more of her products, her mother takes Anthoni to the Showboat Resort for the summer. As Anthoni tries to make a True Blue Friend, determine if there’s truth to the l I had the opportunity to read a NetGalley digital ARC of this middle grade novel in exchange for a review. This book tells the story of Anthoni Gillis, an eleven-year-old girl who has no True Blue Friends. Her mother moves from town to town trying to rise up the ladder of success selling Beauty and the Bee cosmetics. Hoping to sell more of her products, her mother takes Anthoni to the Showboat Resort for the summer. As Anthoni tries to make a True Blue Friend, determine if there’s truth to the local rumors about the Boulay Mermaid, and help her mother bring her business back to life readers will get a great summer novel full of swimming lessons, back yard barbecues, and relationship drama. I think that middle school readers looking for a vacation read and who enjoy friendship drama will enjoy reading this book. Anthoni is a quirky girl who enjoys comic books and friends who are strange in a good way. There’s a lot about the characters that ring true for this age group. This book has some good take-aways for adolescent kids who often have a difficult time determining who their True Blue Friends are. After a wobbly start, I couldn't put this book down. The voice is incredibly genuine--it feels like it's narrated by an eleven year old girl. This is a great look at family: narrator Anthoni and her mom are close and supportive, and while they experience bumps along the way, they're always there for each other. The book has the "magic of summer" vibe, complete with Fourth of July celebrations and swimming in the local lake. It also has some genuinely funny moments that made me laugh out loud. Mos After a wobbly start, I couldn't put this book down. The voice is incredibly genuine--it feels like it's narrated by an eleven year old girl. This is a great look at family: narrator Anthoni and her mom are close and supportive, and while they experience bumps along the way, they're always there for each other. The book has the "magic of summer" vibe, complete with Fourth of July celebrations and swimming in the local lake. It also has some genuinely funny moments that made me laugh out loud. Mostly, this is a heartwarming look at friendships that unexpectedly happen when you're planning for something else. I was especially moved by the friendship Anthoni has with a former vaudeville star who runs a hotel. By the end, I was crying happily. thank you to the publisher for the review copy. All opinions are my own. MAYBE A MERMAID transported me back to summer camp in Northern WI. Anthoni and her mother spend a summer at her mother’s favorite childhood resort. They arrive to find it in decrepit condition and run by a strange and mysterious ex-Vaudeville star. Anthoni spends the summer trying to make a True Blue Friend, but she also finds herself drawn to investigate rumors that a mermaid once lived at the resort. The two goals converg thank you to the publisher for the review copy. All opinions are my own. Anthoni and her mother spend a summer at her mother’s favorite childhood resort. They arrive to find it in decrepit condition and run by a strange and mysterious ex-Vaudeville star. Anthoni spends the summer trying to make a True Blue Friend, but she also finds herself drawn to investigate rumors that a mermaid once lived at the resort. The two goals converge in the end, and Anthoni ends up learning that True Blue friends often come in unexpected circumstances. The whole time I was reading this beautiful story I felt my heart being tugged back to my childhood! Summers taking swim lessons and seeing those friends on cape cod I knew for two and a half months a year. Cameron’s cast of characters are so multi dimensional that you feel like you could have a conversation with each one. I loved meeting Anthony, Charlotte and DJ and following along as this unlikely friendship sparks the hope we all need. I LOVED this book. I had to say that first. I got this book as an ARC through Netgalley in exchange for an honest Review. It's not so much a mermaid book. but that is alright. I liked the characters and description. It felt like it could be anytime. Because how kids develop friendships doesn't really change. And their need for a connection. It reminded me a bit of Joan Bauer's books like "Hope Was Here" (She was just a random book I picked off the shelf to build up my readers advisory muscles. Y I LOVED this book. I had to say that first. I got this book as an ARC through Netgalley in exchange for an honest Review. It's not so much a mermaid book. but that is alright. I liked the characters and description. It felt like it could be anytime. Because how kids develop friendships doesn't really change. And their need for a connection. It reminded me a bit of Joan Bauer's books like "Hope Was Here" (She was just a random book I picked off the shelf to build up my readers advisory muscles. You can't really recommend the Dark Tower Series to grade school kids no matter how obsessed you are) I can't wait to read more from Josephine Cameron. I read this as a read aloud with my fourth graders and they LOVED it. In a recent conversation about favorite book characters, several said that Anthoni is one of their favorites from this year. Josephine Cameron has crafted a novel that speaks to kids (and grown ups!) through humor, emotion, and a touch of mystery/suspense while dealing with what is at the roots of true (blue) friendship. Charlotte Boulay is my favorite character in recent memory, middle grade or otherwise! (I kept picturing Shirley MacLaine in the movie version.) But I loved this whole book, from the imaginative Beauty and the Bee sales to the wacky, dilapidated Showboat resort, and the mystery and surprising friendships at the heart of it all. A perfect middle grade summer romp, with real depth. No maybes about it, MAYBE A MERMAID makes a big splash in this debut MG novel. A story about True Blue Friends, it will make you laugh, cry, and brim joy. I look forward to reading many more books by this author! Delightful reading. Magical and fun for all Mermaid lovers! I like that there are both positive and negative aspects to the characters. Sometimes in surprising ways. I enjoyed this quick read more and more as the story progressed. The character building is great and the ending is very satisfying. I look forward to reading more from Cameron. A heartwarming book about what real friendship means. A lake, a meow, a beemobile, and of course a mermaid all add to the uniqueness of this story.